By now, Haikyuu!! has made sure we all know that its focus is on Karasuno as a team. Hinata and Kageyama are the center of attention, sure, but it’s refreshing that the last three episodes have centered on Karasuno’s dynamic as a team. Episodes 08–10 focus on bringing Nishinoya and Asahi back, and subsequently, dive deeper into the reasons they both left. Nishinoya, the so-dubbed “guardian deity” of Karasuno, is a libero, responsible for being the last line of defense for the team—the “2cm that keeps hope alive” (the two centimeters in question are his hand between the ball and the floor, keeping it in play). Asahi is a spiker, a third-year who had shied away from the terror and responsibility of shouldering the team’s hopes while spiking against a wall of blockers. It’s easy to see how these two, especially after bringing in Sugawara’s guilt as a setter, will be the next example of how volleyball is a team sport. Even so, as motivations and reasons are revealed, you can’t help but get caught up in it, wanting to shake the characters and bring them back to their senses. Although convincing people to work as a team isn’t a new concept by any means, with everyone’s personalities and the way they contribute and push Nishinoya and Asahi back over the edge, you can’t help cheering. The characters’ worries and the ways they deal with them seem very realistic and grounded in the mind of a high-school boy, as well as in the characters’ personalities. 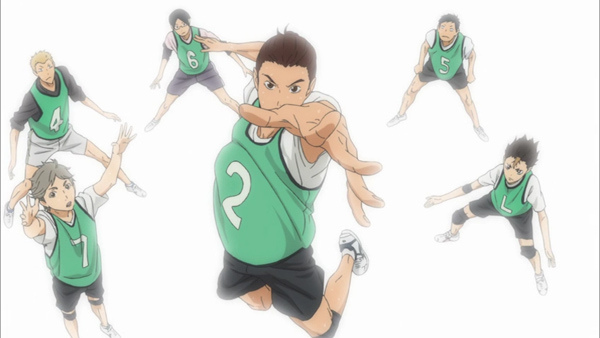 I feel like Haikyuu!! has really gotten the message that, in order to care about sports teams in a series we’re already predicting results for, we need to care about the characters—all of them—and not just because they’re on the same team as the main characters. All three episodes deal with expanding the Karasuno family and bring them all a little closer together, which is a good thing, since the training camp with Nekoma, their old rivals from Tokyo, is coming up next. Overall, Haikyuu!! continues to be an incredibly satisfying mix of excitement, friendship, and character development with good visuals and pacing.